When the news broke that SEVENDUST were to release an acoustic album I was understandably excited. After all, my love of this band is known far and wide, from here to Timbuktu (not really, but one can dream!) so I couldn’t wait to hear it. Time Travelers & Bonfires arrived in my mailbox a short time ago and one thing is certain: this is gonna be on REPEAT for a while! The record is made even more special due to the fact that it is 100% crowd funded, SEVENDUST partnering up with PledgeMusic for a direct-to-fan campaign. I think they reached their goal in about 10 seconds, and then proceeded to achieve a whopping 225% of it! Such is the power of the SEVENDUST family, people. So let’s see what’s what. The first half consists of six new songs, the second is re-worked classics. “Under It All” was my instant favorite because of the rhythms and grooves employed by drummer Morgan Rose and Lajon Witherspoon’s singing. Obviously he sounds great on all of them but there’s something special about this one. “The Wait” makes use of an off-beat with a hint of jazz drumming in there, and opener “Come Down” is so strong, I wonder what it would sound like all plugged in. This was also a highlight of the show here at Trees Dallas two weeks ago. One of the more aggressive songs is “Bonfire” with a bluesy and thick guitar structure courtesy of Clint Lowery and John Connolly that seemingly leaps from the speakers at you. Lajon goes back and forth from his snarl to his soft voice and the transition is seamless. I scratched my head at the title of “Upbeat Sugar” but as soon as I heard it I had no more questions, Your Honor. A great tune from top to bottom. Slow and melancholy, “One Life” features a heartbreaking guitar solo and is really well-done. All six of these songs are fantastic. Now, on to the classics. The first of these is “Gone”, taken from my favorite album from the band, Seasons. It still has all the raw emotion of its electric counterpart, but it definitely shines through more on this version. One of the biggest surprises comes in “Denial”, completely rearranged and slowed down some. Guess what? It works! “Trust”, “Crucified” and “Karma” are also redone to perfection, really showing that the biggest strength of SEVENDUST is indeed their songwriting. No matter what form these songs take, they come out winners. Of course the acoustic version of “Black” is gonna be my favorite of the older tunes. 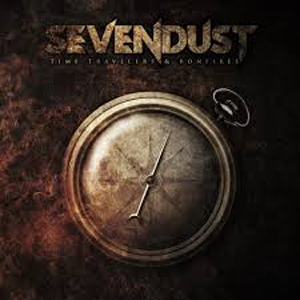 Stripped down, yet losing none of its original bite, this was my introduction to SEVENDUST, the first thing I heard after my specially ordered copy of their debut CD came in at The Wall (oy!). It was love at first listen and it has remained that way ever since. After nearly 20 years of being a fan, Time Travelers & Bonfires is a great way to spend some time with the old and the new. So pull up a chair, grab a cold one out of my cooler, and let’s enjoy, whaddaya say? Pick up your copy of Time Travelers & Bonfires in the KNAC.COM More Store right HERE.